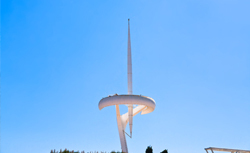 See where the 1992 Olympics were held with a tour of Montjuic, Barcelona's Olympic Stadium. It was a very rainy and overcast day so the ride up the mountain with the view cloudy, didn&apos;t make for our best photos. Good narration and covered a lot of area, although made the mistake of the last stop of the night not being near our hotel. Montjuic is a beautiful hilltop park with expansive views of the city, the port, the sea and the surrounding hills. No one would believe this, seriously. Visited Gaudi Park, La Sagrada Familia & La Rambas again. This was a stop that Barcelona Day Tours took us too. This was a stop that Barcelona Day Tours took us too. We went inside and it is quite impressive.